Just to review the approach I have proposed, persuasion really breaks down to three concepts: rapport, messaging and delivery. Today, I want to chat with you about (largely nonverbal) ways to establish rapport and the implicit credibility. Next week, I will discuss how to convey a message that resonates with your counterpart. Based on previous posts, you know this is code for striking a cord at the emotional level. Given what a fundamental human process this is, you can imagine, like so many aspects of the Business Brain Model℠, this has an evolutionary background: both originate from the subconscious limbic part of the brain. *Rand Swenson, M.D., Ph.D., Chair of Neurology at Dartmouth, dedicated a Chapter to the limbic part of the brain if you want more. Now let me introduce you to some sources who have a lot of this stuff figured out, and I will draw on their work often in this resource. However, as always, I will interject my personal (business) experience and will, when needed, translate some of their ideas into a business context. 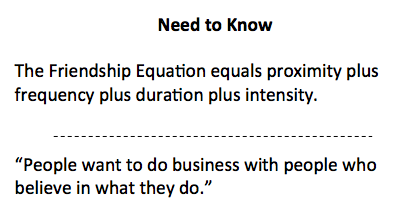 One way to create some context around this idea of rapport is a so called “friendship formula” described by Jack Schafer in his book “The Like Switch.” This goes beyond simple rapport but I believe the concepts are relevant to your success. Friendship equals proximity plus frequency plus duration plus intensity. Proximity: the distance between you and another individual and your exposure to that individual over time. Frequency: the number of contacts you have with an individual over time. Duration: the length of time you spend with another individual over time. Intensity: how strongly you satisfy another person’s psychological and/or physical needs through the use of verbal and nonverbal behaviors over time. You can’t help but note the paradox of a list of to do features for something that should be natural! Nevertheless, there are some useful takeaways for you in the above. Now – let me suggest you watch at least one of the following (you will note not all are about business). And while I say they are not about business – you, who are astute, will note content relative to leadership and innovation – topics of other posts from the Business Brain Model. After you watch each – close your eyes (this will help you use a different part of your brain for processing) and reflect on why you felt rapport. No heavy lifting, but these are good overviews and reflect the importance of passion driven values directed to important causes. 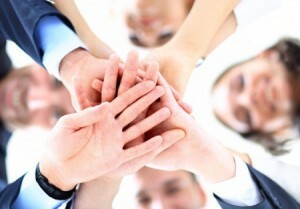 Before you can persuade anyone of anything you have to be on the same wavelength. This is achieved by what will largely be nonverbal reciprocal cues per the concept of rapport. Once that happens, the time is right for the message – watch for next post. Not to preempt the next post but I think Simon Sinek sums it up the best – people want to do business with people who believe in what they do. People need to know who you are and what you believe in before they will believe and/or trust you.